1. I couldn’t find ANY way to get to the community section from the homepage of the website, there’s no community button in the header either. After searching for a while, I just ended up typing in syntorial.com/community to finally get here. 3. The titles are too big to properly scroll and read with ease, some text is so small that I can hardly read it, and I couldn’t find a button to submit a new topic. Obviously I found this form at the bottom of the page, but it blends in with the background way too well. It feels like everything in this forum (including the community itself) is hidden. While it may be basic and lacking in flair, it’s easy to use and see many topics at once with the relevant information. So on my bigger 1080p monitor I can see the borders in between posts (which were hidden on my 1440×900 secondary) as well as read the authors of topics and the information, which is good but makes it very hard to browse on my secondary while working on my primary. I hope this information helps in making the forum more accessible to everyone. 2. 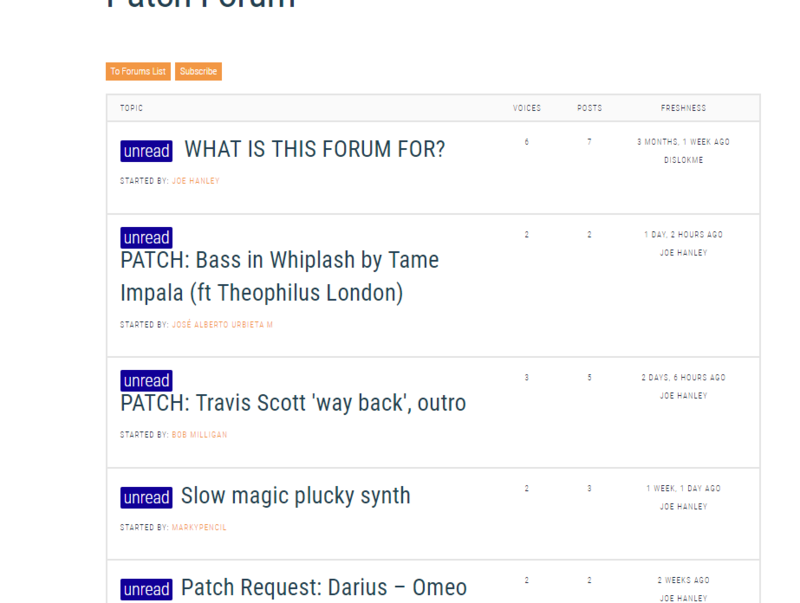 The Patch Forum is the only forum currently. We may add a general discussion forum if there’s a demand for it. 3. I hadn’t thought about this, but now that you mention it, the titles do seem too big. Especially compared to other forums. I’ll tinker with this. So on my bigger 1080p monitor I can see the borders in between posts (which were hidden on my 1440×900 secondary) as well as read the authors of topics and the information, which is good but makes it very hard to browse on my secondary while working on my primary. I’m not sure what you mean exactly. Can you post screenshots from both of your monitors so I can see the difference?